This badge was issued to Cris Flores on 20 Dec 2017. 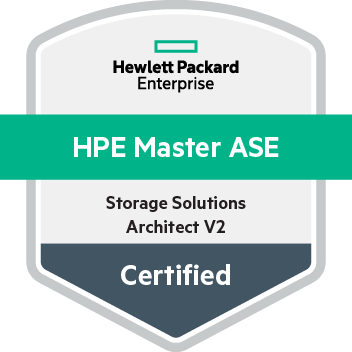 This badge validates the achievement of the HPE Master ASE - Storage Solutions Architect V2 certification. The certification verifies an earner can translate customer business requirements into an enterprise, multiple site storage solution across physical, virtual, and cloud or IT as a Service (ITaaS) environments. Master ASE badge holders are able to design hardware-agnostic, centralized deduplication, and backup/recovery solutions for critical data protection. Complete Architecting Multi-Site HPE Storage Solutions, Rev. 16.11 course. Training is highly recommended but not required. Pass HPE0-J79 - Architecting Multi-Site HPE Storage Solutions exam.